Status: offline Very Cool Colors Indeed. Question is how will units be highlighted when you select say all of XLVII Corps? Playing an HPS PC game right now and the colors hide the unit type and often the highlighting of the units. Especially if they are further down in the stack. Status: offline In this shot a German Corps HQ has been selected. It is outlined in purple. It's subordinate divisions are outlined in blue. Peer units that are part of the same command are outlined in yellow. It's superior HQ is outlined in orange. Edit - This is a shot from the '41 campaign, not Typhoon. Status: offline The map looks nice, much better than I expected to be honest, good job. I'm very much looking forward to this, but I have to say I'm not keen on the counters at all (colour of the panzers aside of course ) They look quite retro pc if you know what I mean (might be the font as well as the way the counters are set out). I play the SSG games a lot, and think their counters look the nicest of the 'boardgame' pc games if you know what I mean. Are the ones we see at the moment your final design? The colours are good and easy on the eye, some of Gary's other recent games have been dark, with little contrast. I like the lighter WitE Map and the basic unit colours are : German grey, SS black and Russian brown, which are standard. The colour inserts look 'right', nice colour mix and good contrast. We will be looking at this scene for hours and hours, in the near future, and I vote for easy on the eyes. Status: offline The 'counters' look very similar to TOAW, are the designers the same out of interest? Status: online No, different designers, although I can't say for sure about the artists involved since I don't know what artist did the TOAW counters (Marc from Matrix did the counter art for WitE). I haven't seen TOAW's counters and I was involved in determining what information appears on the counters and there was no intention or desire to be like any other particular game. Status: offline Grey, Black and Brown works for me. I am glad there is a hot key to toggle the colours! Admittedly, I expect to turn on the colours occasionally to check that my units are sticking together! Status: offline The color scheme is similar to TOAW but not the same. TOAW has a 3 color scheme and one problem is the 3rd color is used for things like the combat strengths and that sometimes presents readability problems. IMO, the WitE counters look nicer (I really like the multi-color scheme also). Status: offline I think the counters look ok, not great but ok. The reason I asked was they looked similar design, and the small triangle in the top right of some of them was something on that system. I also think this game and TOAW lists all participating vehicles etc, but could have that wrong. Status: offline "In this shot a German Corps HQ has been selected. It is outlined in purple. It's subordinate divisions are outlined in blue. Peer units that are part of the same command are outlined in yellow. It's superior HQ is outlined in orange. " Have you thought of possibly using colors on the same sector of the color wheel to highlight HQs and the various levels of subordinate units? Or possibly use various shades of the same color ... Superior HQ Maroon, HQ Red, sub units half way between red and pink, then the last level pink (oops Pink may not be good) .... try Navy Blue, cerulean, sky blue, cyan. Status: offline Changing colors would probably be a very low priority right now but you never know. Now look at the color of the 4th Panzer Group (the dark pink in the center), in my opinion this is one of the most beautiful unit colors of the game... I think all the colors are beautiful, but this is one of the best. Why is it that I see an "=" sign in between the counter values and in other posts I see a "-" ? You can toggle between Attack Strength - Remaining Movement Points and Attack Strength = Defense Strength. The "-" and "=" are different to help remind you which values you are seeing. Status: offline Are those values for the entire stack? 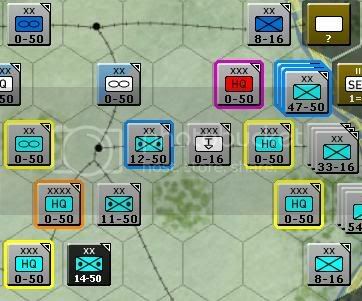 It would seem so as the average German infantry division has an attack strength of 8 in that screenshot, and there's a stack of 3 units with a strength of 24. It might be confusing if the strength of the stack is reported instead of the individual unit strength, or is there also an option for that? Of course, perhaps that particular infantry division is indeed at the least 12 times as powerful on the attack and 10 times as powerful on defense as some of the Soviet Rifle divisions in that screenshot. Are those values for the entire stack? It would seem so as the average German infantry division has an attack strength of 8 in that screenshot, and there's a stack of 3 units with a strength of 24. The value is for the entire stack and you just have to scroll over it to see the contents or you can click on it for more detailed information. Status: offline Also, when you are displaying Attack Strength - Remaining MP's it shows the MP value for the unit with the most MP's remaining. Status: online Normally you see your units with the - , because during your turn what you are most interested in is the attack ability of your units and the MPs they have remaining. You can toggle this to the = if you want. For enemy units during your turn, you always see the = for two reasons. First, the MPs of units are only set at the start of their turn, and they are not fixed, but can vary by a lot based on fuel/supplies on hand and leader admin/initiative checks. Second, you are usually interested in seeing the defense strength of the units you may want to attack. Now the defense strength that shows is nothing more than the basic combat value of the unit (what is shown as attack strength) times a muliplier that is based on the combined values of the terrain and fort level in the hex. A unit in clear with fort level 2 provides a x3 multiplier (1+2). A unit in Light Woods with a fort level of 3 provides a x5 multiplier (2+3). Status: offline Where are the roads? That is probably just what the Germans said once the invasion started! Most "roads" were dust tracks at best. I believe the designers felt they were not enough of a factor to be represented in the game. Railroads were the primary means of supply and strategic troop movements. That is probably just what the Germans said once the invasion started! Yes, roads are not it. To some extent roads are modeled via terrain. Status: online We made a design decision not to include them. We felt that at this scale they were not needed. Status: offline Could you put two dots on the o in Konigsberg to make it Königsberg? They are missing in the map screenshot. It would be nice to have the proper German spelling of the German towns. We made a design decision not to include them. We felt that at this scale they were not needed. It's probably more important to follow the rail lines than the road. A armored division in road march takes up a lot of space to full utilize the road. Then there's the time spent getting into road column and getting out. Also any road in Russia might not be like the freeways are now. After a winter or two the road most likely was so pot holed it was safer and easier on equipment not to use them. Could you put two dots on the o in Konigsberg to make it Königsberg? They are missing in the map screenshot. It would be nice to have the proper German spelling of the German towns. ..and Russian town names with proper Cyrillic spelling..
That's very unusual/unorthodox (stacks showing their full strength) and not entirely user friendly, I hope the rest of the interface is more user friendly. The player constantly has to keep in mind that the top unit doesn't depict its own strength, but the strength of the stack. The decision not to include roads will haunt the development team just like the decision not to include the northernmost part of the front. Personally, I think that both are somewhat silly but as long as the game is good I'll still buy it. It will be a rather odd experience to have to imagine a fight for the few crucial highways in the Soviet Union, though. I do hope that roads are to a significant degree abstracted into a terrain. As in: if the hex would normally have a major road (a highway) in it, it would be significantly more passable in mud or snow conditions. The decision not to include roads also frees up more than a few German divisions who spend their time in the Soviet Union improving roads. The Soviet definition of a road seems to have been fairly "liberal", as in: as long as nobody's growing a crop on it, or as long as there are no trees or natural obstacles on it, a piece of land is a road. There would be a few possible "realistic" options: a toggle for English or Cyrillic names for towns in the Soviet Union, with towns in German and in German occupied areas outside the Soviet Union in German if they have a German name (considering that they are the occupiers, Polish towns would not be named in Polish if there is a German alternative, for example). Another option would be for the German side to make a map in German and for the Soviet side a map using Cyrillic letters. I have found it very helpful since you will often want to attack with an entire stack and it saves having to do the math of adding up the values of three units to get an idea of the attack potential. YMMV. That said, from the screenshot above those rail lines look pretty thin to me (or maybe the units are too big and cover too much of the lines). Q: Have you considered e.g. an option where holding down the space-key the rail lines move to the "top" of everything on the map, with a thicker line used of course, and using a different color or similar for each portion of rail line to reflect its supply ? E.g. No supply (=0) or breach caused by partisans = red color line when holding down space, black line = supply 5, brown line = supply 1-4. Holding down <space> while scrolling the map would give you a very good overview on the supply situation over the entire front. Edit: Or some kind of supply color indicator drawn in/over each hex that is visible when holding e.g. <space>, perhaps this is easier to implement? Status: offline Rail lines are part of the map art so they can't move to the top or change color. You can toggle units on and off to see just the map, including rail lines. There is a hotkey to show who owns what rail hexes and whether there is any damage. There has been an ongoing discussion for some time about how best to show supply status.